I have been in love with space since I was a little kid. It started while watching episodes of the original Star Trek with my Dad. I knew we didn’t have ships like the USS Enterprise and that we couldn’t travel to other planets, but I always felt, always knew, that it was just a matter of time before it happened. My enthusiasm was shared by my Dad, who encouraged my curiosity and answered all my questions about what we would do someday. Not might, would. When the Space Shuttle program started, I was a starry-eyed kid watching it all with absolute joy and pride. We built a spaceship! We were going into space! This was cool! It held such promise. There was a sense of excitement to it all. Each small success was another step, in my mind, toward the ships I saw on Star Trek. Each tragic loss was a reminder that exploration and discovery are dangerous, but still worthwhile pursuits. What happened to those ideals? Our shuttle program is dead. 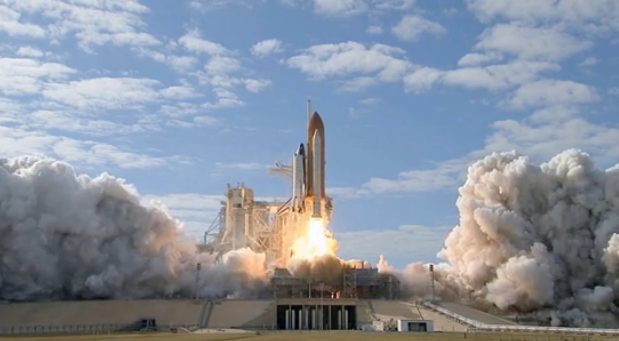 I watched Atlantis launch last year with my daughter and I cried knowing we have no plans to go, well, anywhere. The International Space Station is cool but it’s not evolving, expanding, pushing us further. The space program in the United States has been gutted, neutered, and made unimportant. And that’s just wrong. It’s expensive to go into space. It’s dangerous to go into space. It’s scary, and exciting and challenging and absolutely worth it, but we’ve put space exploration at the bottom of a very long list of priorities. Yes, there is plenty to do here on Earth, but we can’t cease to explore. Our challenge it to make space exploration a priority, to make space so damn exciting that our kids will be building the ships, launching the rockets and donning the spacesuits because they couldn’t image it any other way. The Fight For Space kickstarter is seeking funding for a documentary on the decline of the United States space program and why we must turn it around. The trailer includes clips from people like Neil deGrasse Tyson and Bill Nye and if it is fantastic. Watch it and see if you’re not inspired. They’ve already reached their minimum goal so the film will happen, but they hope to hit their stretch goal and see a wider release of the film. This is not a studio. It’s just a guy who believes in the importance of space exploration and wants to reignite everyone’s passion for space. I think his documentary could go along way toward achieving that goal. I interviewed Paul in the most recent GeekMoms podcast so download the episode to hear him talk about his hopes for the film. I also donated because I believe space exploration isn’t just important, but essential. I hope you’ll join me in the Fight For Space. I think the odds are in favor of us inviting our extinction through space travel rather than finding the Vulcans. Still, it's one of the most important causes humanity should be pressing toward.